How would you feel if you had to see the world through a pipe hole? That’s exactly how mobile users feel when they have to see your website, which is built for desktop computers and big screens, on their mobile devices. Last thing you know, they are so annoyed by your website’s overall experience and unsightly looks on their smart phones that they promise to never come back. WEBIZ will not let that happen to your website. Being a web design company fully aware of its work, we’ll help you build a professional looking responsive website for your business. Responsive website design is meant to work on virtually every screen size that exists in our world today. With the sudden shift from desktop computers to mobile devices it has become inevitable for every business with a website to make it responsive. WEBIZ professionals have understood the latest needs of website designing and web development. 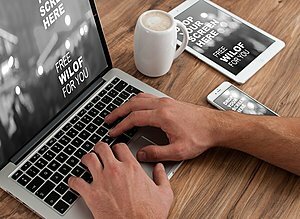 Our custom tailored responsive websites make businesses become visible on all mobile devices in addition to desktop computers. We take care of the most important factors when building a responsive website. Making a website responsive to different screen sizes is not what the main aim is. Our web designing professionals ensure that your website is designed in such a way that only the most relevant, appealing and attractive content is visible to your website visitors no matter what device they are viewing it on. A lot of thought and work goes behind such a design, but it’s our experience that has put us in a position where we can design such responsive websites within unprecedented short times. By doing this we put you on top of the competition and make your website view able on billions of smart phones, tablets and other mobile devices that are being used in the world today. As a web design company it is our job to make your website repay you what you have invested in it. By literally targeting millions of customers around the world with a responsive website you could take your ROI to completely new levels. Call us now and let’s start working on your responsive website.